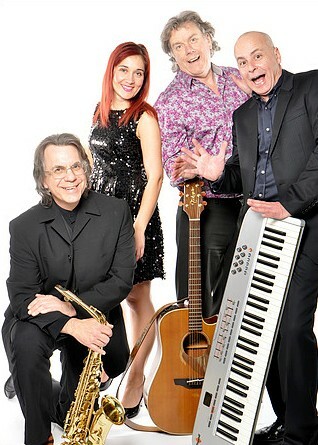 SAMS Band is a well organized, experienced outfit of professional entertainers comprised of Keyboards, Female Vocals, Male Vocals / Guitar, Saxophone / Harmonica / Vocals. Their music offers a great selection of up to date hit songs and classics too, and their line up means they can feature great harmony vocals, classy instrumentals, and non-stop dancing. Musically they cover most styles, keeping all ages dancing at birthday parties, filling the floor at a wedding, or entertaining at a club or corporate event. They have recently added a handful of 60s / 70s classics for a couple of retro parties, and also a couple from the Kiss FM playlist. SAMS Band is fully self-contained, supplying a high quality sound system, lights, and professional presentation. As part of the entertainment package they can also offer DJ facilities, background music & Bandeoke (that right... they play & you can sing along! ).